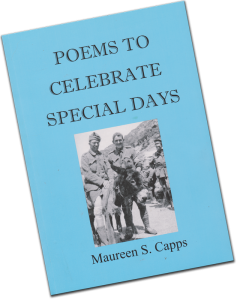 Poetry Page highlights poems by artist and author ‘Maureen Sylvia’ the proprietor of the gallery and well-known for her children’s poetry. Her two books ’Please Say Me I’m a Poem’ and ’Poems to Celebrate Special Days’ are great to read and are available for purchase at the gallery. Each month we will feature one of Maureen’s poems and from time to time a poem by a guest poet who may be ‘big’ or ‘little’. 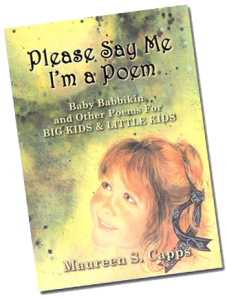 There are poems for tiny children, for the 6-8 year old fantasy age, for middle primary and older children. There are also poems for 'big' kids, so this book is for grown-ups too! This is a unique anthology of over 100 poems with some set in a West Australian context. Maureen has illustrated them with her big-eyed 'little' people. You will discover poems that touch your heart. They bring out the child in us all. This more recent publication is very popular with middle-primary aged children and is useful at home and school as a means to enjoy learning lots of true fact about our state whether in a group or individually. The poems in this book are very 'West Australian' and include poetry about ANZAC Day, Aboriginal culture, James Stirling, Day of Trees, Mothers’ Day etc. All being occasions we celebrate in WA. They are a valuable resource. 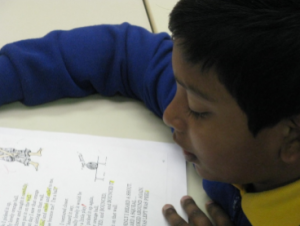 Many of the children who have enjoyed these poems within the classroom now write their own. Sunday, 26th August from 1pm - 3pm You are very welcome to read your own poems or enjoy listening to others. The essence of the wheat-belt can fit within one’s hand. Wheat seeds, oats and barley; the three crops being planned. Amazing little seeds of hope with transforming powers. Waiting to be planted, usually at the end of May. With plough and combine ready, the farmers hope and pray. Their livelihood dependent on the timing of the seasons. But all know it’s a risky business, and offer up their reasons. The tractors out and running. Now, nobody complains. And silently beneath rich soil the little seeds start growing. So exciting when green shoots appear not long after sowing. All competing for their share of light; emerging tall together. Forming a strong and vibrant crop in harmony with the weather. And as one passes many a farm, what a joy to behold in Spring. Green crops, full-grown all ripening. Such a glorious thing. The finishing rains arrive on time and stalks turn golden yellow. Nearby sheep are happy too. One hears them baaaa and bellow. The heads of wheat maturing now with the start of summer-time. Soon ready for the harvester; the crops all in their prime. More hard work for the farmers who often help each other. Then time for celebration, and a holiday to recover. Yes the essence of the wheat-belt can be picked up in one’s hand. Wheat seeds, oats and barley, anew from our rich, brown land.